Readers’ Choice: What Era/Area was missing? The pirate stories run the gamut from ancient Amazons to space-age scalawags, with several tales in between. What other pirate stories would you like to see? What would be fun or funny, or the most spine-tingling or adventurous? Just a place, and/or a date, please. No characters or plots–give a location and give a year. No other story details, although you can say why your particular selection is your favorite. If enough people want the same timeframe and/or the same locale, that could end up the setting of the next pirate story. Leave suggestions in the Comments section. 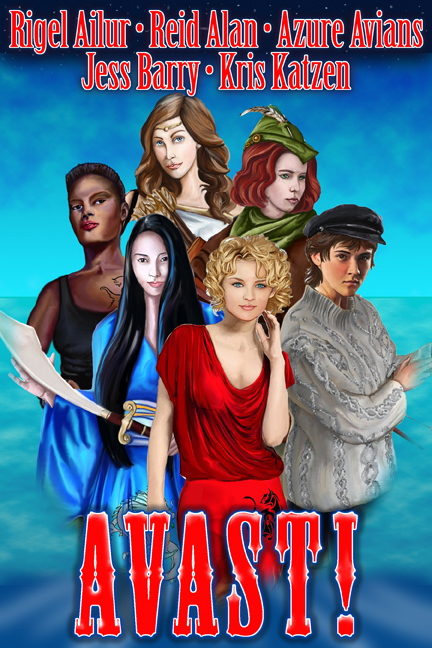 This entry was posted in Azure Avians, General, Jess Barry, Kris Katzen, Reid Alan, Rigel Ailur and tagged action, adventure, Anthology, Azure Avians, Bluetrix Books, Fantasy, Jess Barry, Kris Katzen, Magic, Pirates, Reid Alan, Rigel Ailur, romance, science fiction, submarine. Bookmark the permalink. 6 Responses to Readers’ Choice: What Era/Area was missing? I want time pirates that steal time from those with too much of it and give it to those of us who never have enough! And I’m sure the Italian marine Republics (Venice, Pisa, amalfi and Genova) had some forms of piracy between themselves and/or other countries… Haven’t checked into that history, though. Although the sack of Costantinople can be a form of piracy – the Venetians too the crusaders there instead of the Holy Land (they still call it a crusade even if they didn’t actually reach Palestine and ended up slaughtering other Christians). Pirates undoubtedly exist in every time and every imaginable setting… These are two I’ve considered writing about myself! Ice Age, The Temperate Savannahs away from the ice. The thing is to figure out what constitutes “treasure” for these settings. 21st century Philippines and Asian area- they’re doing it now!